Royal Belum State Park is part of the Tentative list of Malaysia in order to qualify for inclusion in the World Heritage List. Belum Park is a large protected area of tropical forest in the northern part of Malaysia. The forest is shared with Thailand that also protects it as a national park, placed on T-list as well. As a transnational proposal, both parks have higher chance for inscription, although the path has not been announced yet (Malaysia placed it on T-list only in 2017). It is quite easy to get to Belum State Park with a rental car. From Penang it is about 2.5-hour drive and the nearest WHS of Lenggong Valley is only 1.5 hours away. It is not the most popular part of Malaysia and the tourist base is quite small. 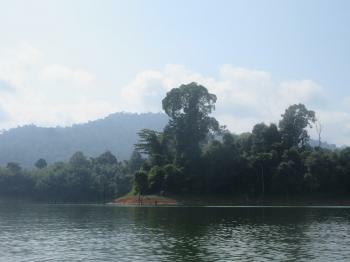 It seems that the park cannot be visited on your own, as it requires boat transport on Temenggor lake. Interesting thing is that the lake is artificial and was created by Malaysian government to make life harder to local communist militias (this is what our guide told us, official reason was to generate electricity). The rebelliants applied hit and run strategy escaping to Thailand, what was obviously much more difficult with the huge lake in the center. Since 1989 there are no fights in this area. The most convenient way to visit is booking one of the trips offered by Belum Tropical Resort. This is what I did and the experience was really pleasant. At first the guide took us (all transport by boat) to Rafflesia, giant parasite flower whose pitches may reach over one meter of diameter. Unfortunately no flowers were blossoming at that moment but the chance is quite high as there are several spots. At the end we took a small jungle trekking (beware of leeches, although they are not dangerous, hiking boots recommended). According to the guide, there is fair chance to spot elephant or deer, but there is also a population of 60 tigers, that occasionally come (at night) to salt feeders. But the best part of the trip was a visit to local village. Local tribes live near the lake with limited contact with civilization. They are very friendly and allow walking and taking photos without asking for a fee. You can even try to shoot with blowgun, which releases arrows with a speed of 200 kmph. I would even say that it is worth considering inscribing the park based on mixed, not only natural criteria. Overall Belum Park is a nice place and definitely number one of Malaysian T-list.